Watercolor is the whimsical language I have to express my emotions. Danielle helps me to discover new paths of happiness and illusion, so…. longing for this new course to start!! Congratulations! Please email us at contact@jeanneoliverdesigns.com with your address and we will get all of the goodies out to you. 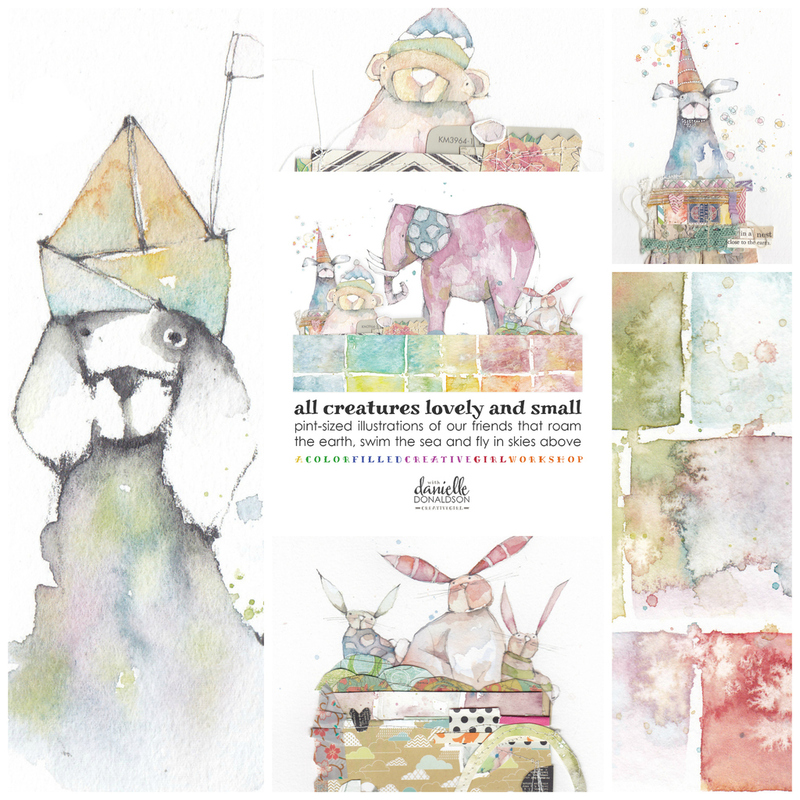 I know there are a lot of artists waiting to dive into Danielle Donaldon’s newest course, All Creatures Lovely and Small, that begins on Monday! To celebrate the launch of her newest online watercolor course we are giving away some of Danielle’s favorite new products in her shop! 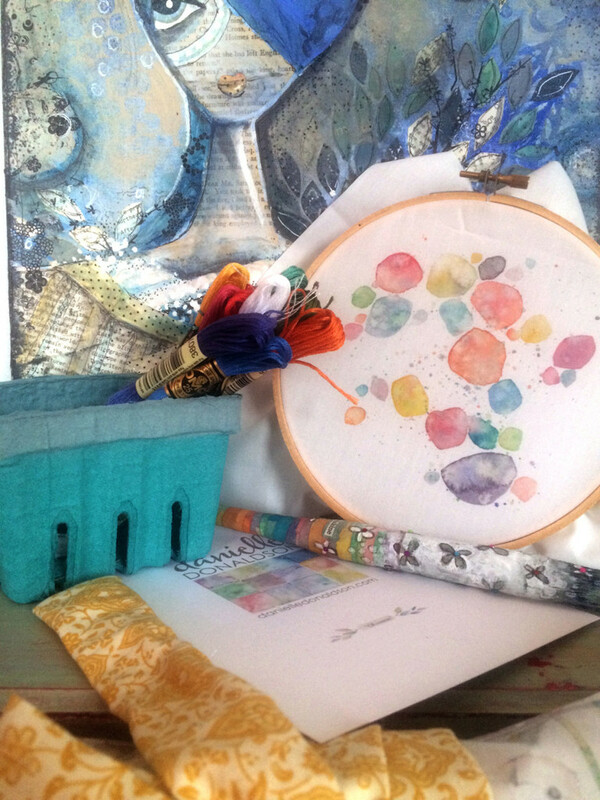 We are giving away a craftyGIRL embroidery kit, creativeGIRL brush roll, Danielle’s awesome book CreativeGIRL: Mixed Media Techniques for an Artful Life and three pre cut mats for your own work. One lucky winner will receive the whole giveaway totaling $104! To enter the giveaway just leave a comment on this post telling us why you love working with watercolors or why you want to learn more. This giveaway will close on March 14, 2016 at 11:59 pm MST. I love the spontaneity of watercolours and the serendipitous effects they create. I can’t wait to see what effects Danielle has to show us in this new class. I love working with watercolor so because of the unique colors and transparency of watercolors and certainly want to improve at using them. I love working with watercolor and others mediums as well. I’m always looking and striving to learn new techniques that I haven’t tried before. Student for life!!! Sweet! I am just learning to use watercolors and looking forward to learning lots from Danielle!! Just posted on Facebook and Instagram. I’ve been following you both already on Instagram. That doesn’t sound creepy at all! ? I am now following on Instagram (@wrenhausgraphics)…so excited to take the next Danielle class! I have posted the class with graphic on my Facebook…excitement is building! why watercolor? The array of colors that can be accomplished plus each piece turns out different. Learn more? It’s art. You can never get enough of it. I love working with watercolors because it forces me to loosen up and not be such a perfectionist. Plus, I love Danielle’s work and can’t wait for the class to start! Yay! Why I love watercolors……..beautiful transparency…Danielle Donaldson is in a League of her own….Utterly Fabulous! I enjoy working with watercolours and I want to learn more because watercolours are a wonderful medium – I love the way skill and serendipity come together to make magic. I’m so excited to take this class. I love Danielle’s color choices and have never seen anyone merge color in quite the way she does. Watercolor is a wonderful portable medium, however I’ve never been able to master it. Hoping this class will change that! 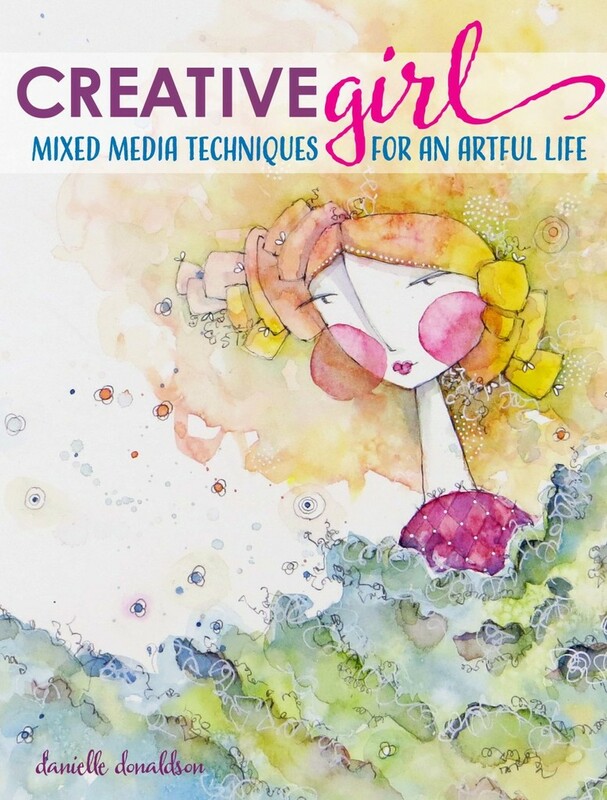 I pinned the Creative Girl book to my Pinterest board…I’ve been wanting it since I discovered Danielle. I just started using water colors a little; would love to learn more about layering colors and how to not get too much water on brush or too little and same with the paint. I love how portable they are and the rich vibrant colors available! Hi, I love the idea of working with watercolour…but I know, I need to know more about them. That’s why I love Danielle’s classes. I’ve signed up for this one already – but I would sure love the “give-away”. I find painting with watercolor exciting because it has a mind of its own.. You never know what to expect. And, it is a continuous learning to experience. Danielle is a master of watercolors and I know I will learn so much. Can’t wait. I love watercolors because they are light but bright and Danielle uses them in an amazing way! Thanks for the chance to win! 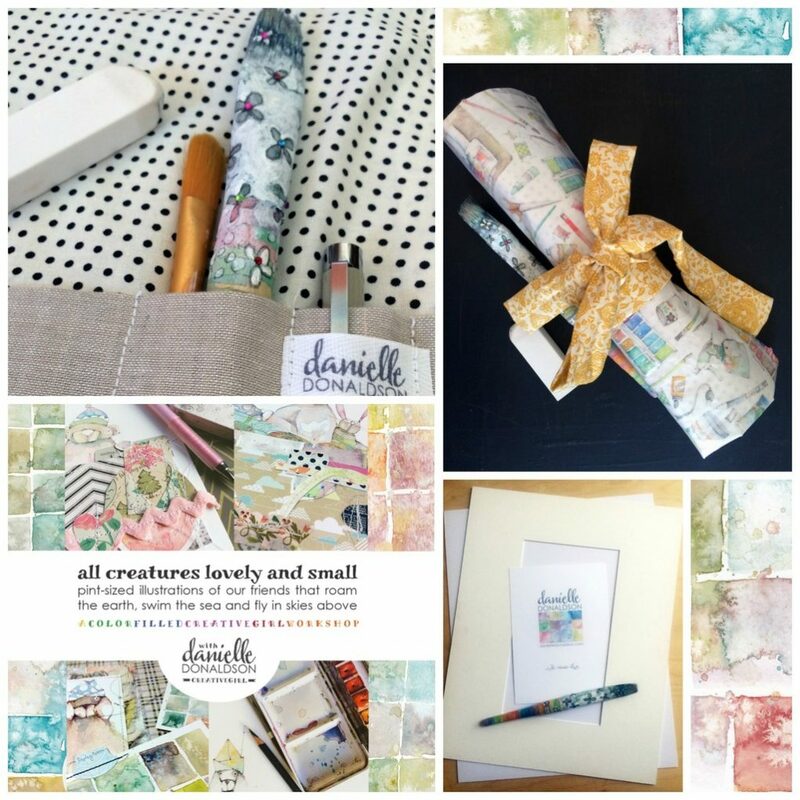 I love Danielle’s courses – so well explained, and such beautiful material. She taught me to finally appreciate watercolours. They are so relaxing to work with – the way the colours just play together is magical! I would love to learn more techniques. Doodling is calming and water colors share the beautiful flow of creativity. Love my watercolors! They give me so much magic when I have NO experience. I’ve taken other classes with you, and you’ve given me so much help in learning how to play with my watercolors and get to know their nuances. And I love your whimsical ideas with the girls and now these fun animals. Can’t wait. WIll definitely share on FB and anywhere I can. I love the way colors mix on the substrate, sometimes they look so dreamy. I want to keep learning to get to that place between realistic and fantasy. I love the look of watercolor and want to learn how to work with it. I love the soft colors produced by watercolor paints. I hope to learn more about blending from Danielle. I have used them in the past and love the way they look on paper. I would love to get back into it. 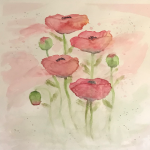 As an artist, and one who is fascinated with painting, I love the workability of watercolor and how simple alterations to the medium can be so addictive and fun to manipulate… And of course, Danielle’s style is most appealing, and I love to learn from her and these classes. Thanks for providing them for us who cannot take a live class. I love your site! I love the softness and peacefulness of watercolors…no harsh lines, just soft edges embracing you! I find working in this medium very soothing! I would LOVE to be blessed with this darling giveaway-thank you so very much and a joyous Easter to you all! I love the way watercolors seem to have a mind of their own. You do your best and then when they dry . . .Voila! Something you certainly didn’t expect. That said, I would love to learn more. Thanks for the chance. Watercolors make me happy. The translucence lets me have my rose colored glasses and I love that feeling. Thanks for this opportunity! I am a work in progress when it comes to art in general as well as watercolor. I love the medium, but realize I have so much to learn. I especially low how the colors intermix and you never really know what will turn out. I am looking forward to this class. I love the softness and dreamy atmosphere they create around me. I love how watercolours blend and combine in almost a magical way! This would be such a treat! Love these classes! 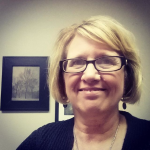 Gave a little love on fb – twitter and Instagram! Hope it helps! I’ve always loved the soft look of watercolours, would love to learn more about how Danielle does what she does with them, her artwork is so beautiful! Danielle helped me find my voice…one that had been drowned out by all of the negative messages from childhood. I painted 48 versions of my own girl after she explained how to find your own #creativegirl! I adore how she blends colors and for the first time in my life I learned to love watercolors! I had already pinned to Pinterest! I just love all the beautiful ways watercolour brings itself to life. I now share watercolour with my preschool grandchildren! Love watercolor! Always full of surprises! And Danielle is such a great teacher! Thanks for giving me such a great new direction late in my life!!! Watercolor is my favorite medium. I am excited to learn more from Danielle to become looser in my work. I love her whimsical style. I love the transparency of watercolor. Danielle is able to coax the most amazing subtleties from her paints; love that! I love the happiness of watercolor – doesn’t matter if the subject is light and whimsical or even a dark broody sky – there is still happiness in watercolors. Looking so forward to this class to learn even more about the transparency of watercolor. I have posted on Fb. Posted to Pinterest and Instagram. I love Watercolors versatility. I love using watercolor pencils in my gardening journal, they give it that sweet appeal. I love how watercolors make me feel, just looking at them I feel peaceful. Watercolors are so fun. I can’t wait to learn the new techniques from Danielle! 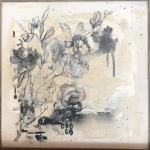 Danielle Donaldson’s Art makes me SWOON! I just pinned her embroidery pic….might have to add that to my wish list! I love the transparency and layering possibilities of watercolors. I am looking forward to this course because the colors are so beautiful and because I love creatures of all sizes. I was introduced to watercolor with Danielle’s CreativeGirl class here. I fell in love and look forward to learning more! Love the beauty of watercolor. I love how forgiving watercolors are. And it brings such peace to work with them. Where do I start??? I happened upon the Oliver website. Was instantly intrigued with the creative figures I found. I HAD to have more. Purchased the “Creative Girl” book and you had me. Forced to sketch images of girls that I would have NEVER attempted before. Thanks so much for helping me expand my world. Would love to be a winner in the drawing in order to further learn from the BEST. Can’t wait for the class on 3/14……..
just signed up for this class and shared this post on facebook ? I want to learn a new skill, and water color seems easier than oils. I think I would like to learn watercolors. I have some of the tools, just been too afraid to try! I love the delicacy and softness of watercolor. I love getting more practice, so I am thrilled about this course. It’s my first with Danielle! I love illustrating and am hoping I can grow my confidence in this area. I am following on IG, I posted on FB and IG! Thanks! I love the effects that watercolor has to offer but have not spent enough time to get consistent results with them. Would love to do more! Thanks for the chance. So excited to be following you on instagram now, too :)!